I was at dinner with Roseanne and we were looking over our menus. The waiter came by and asked us for our drink orders, which went smoothly enough. When the waiter returned to ask us for our meal orders, Roseanne was still looking over the menu and asked for one more minute. I had decided what I wanted, but there was no problem on my part with her taking a bit more time. She was still looking over the menu when the waiter returned, though, and when he asked her what she wanted, she requested a bit more time. I offered to help her decide, but she said that she'd figure it out on her own. The waiter returned and Roseanne seemed genuinely disturbed that he had shown up. She asked for more time, shared a quick laugh with the waiter about her indecisiveness, and the waiter left again. I asked her if she had narrowed it down, or if I could help her decide. She said that she had it narrowed down to six options, and that she liked them all the same. The waiter came back and she said she still wasn't ready. I ordered an appetizer, so at least that went through. The appetizer came and went and Roseanne was still reading the menu from cover to cover and back again. I asked her if she was hungry and she said she was starving. I didn't want to order dinner if she wasn't going to end up ordering anything, but I thought that perhaps that was the best way to force her to decide. 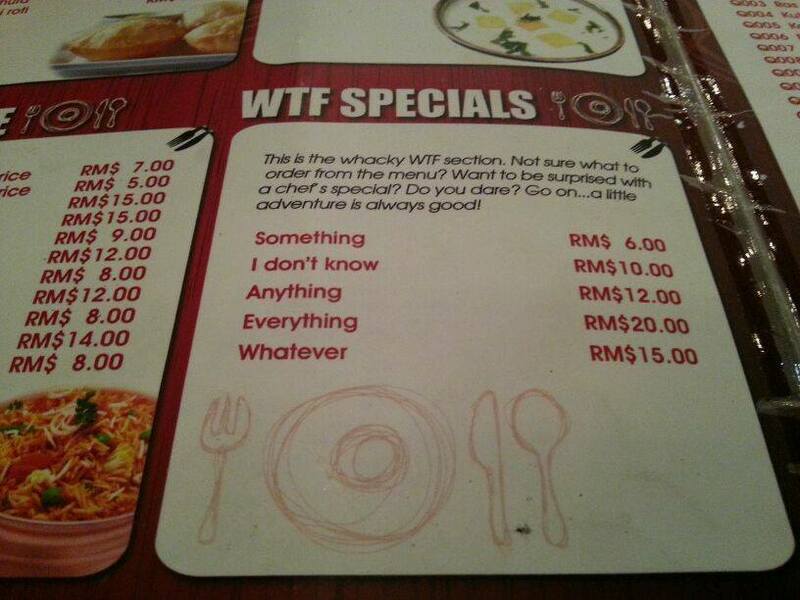 When the waiter returned, I ordered my dinner. When he asked Roseanne what she wanted, she told him that she had it narrowed down to four things. He offered to help her pick something, but she said that she'd figure it out herself. There wasn't much talking between Roseanne and I, as she spent most of her time reading the menu. Sad, really. My meal came, I offered her some, she picked at it a bit, then returned to the menu. When the waiter returned shortly thereafter, she finally placed an order. Then as he left, she called him back and changed it, then changed it one more time. He finally took her menu away and we were just left with each other. But not for long. Less than a minute later, she jumped up and followed the waiter, stopping him in his tracks and switching up her order again. This was insanity. She returned to the table and said, "Sorry, but you know it can be a tough decision, sometimes." When her dinner came, she stared at it for a while then said, "I should've ordered the salad, after all. You think I can send it back?" I said, "Not at this point." She halfheartedly ate her pasta, then asked the waiter for a box in which to bring it home. My dinner was done and he took the plate away. Then he asked if we wanted dessert. "I think we're good," I said. Roseanne asked for a dessert menu. He returned with one, and again, she took well over the amount of time it would've taken a normal human to decide that she wanted the cheesecake. The waiter came and took her order. When he left, I told her, "Cheesecake was the best option. Good choice." Instead of being normal, she jumped to her feet and went after the poor waiter again. When he came over with the dessert, it was a big cookie with ice cream. She again moaned that she should've stuck with her prior choice and I ended up eating most of it. When the check came, I was sure to give the waiter a generous tip. Instead of asking Roseanne what she wanted to do after dinner (I'd still be there with her if I did), I wished her goodnight and good luck. Even reading that was torture. I then imagined a scenario in the future when her child runs into the busy street, and how long it would take for her to decide what to do about it. Could you imagine this woman planning a wedding? Twist: she's an EMT. Intubate or CPR????? She's clearly pulled this routine before. And not just at restaurants. Forget a wedding, how does she leave her house? Damn, there is a story I really want to link here but I can't find it. This guy and gal went somewhere to order food or something, and she couldn't decide what she wanted so he order and they sat down and she said she was hungry but couldn't decide and there was too much pressure and blah blah blah. Anyone remember that one?